Sax Paint Brushes are handcrafted with high-quality, durable materials and designed to withstand various art projects. They provide optimal brush strokes for your crafting needs. Superb color holding, spring, sharp edges and smooth application is the result you will achieve with our Optimum Golden Taklon brushes. 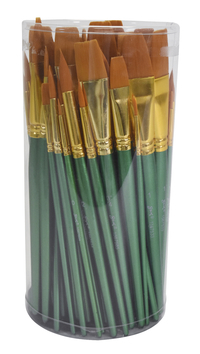 Golden nylon synthetic hair brushes work well with oil, acrylic and watercolors. Goldtone ferrules are seamless and made of anodized aluminum that resists rust. Long handles are made from hardwood and have a lacquered finish.